The Apply Online validation errors are set up by the Lenders. Some Lenders wont accept an overseas address anywhere within the application, which is a restriction they have put in place. Some Lenders will require an address, even for a pre-approval. If your overseas address won't validate, simply enter Australia as the country, (you might also need to enter an Australian suburb/post code) and clarify the actual address in your notes. 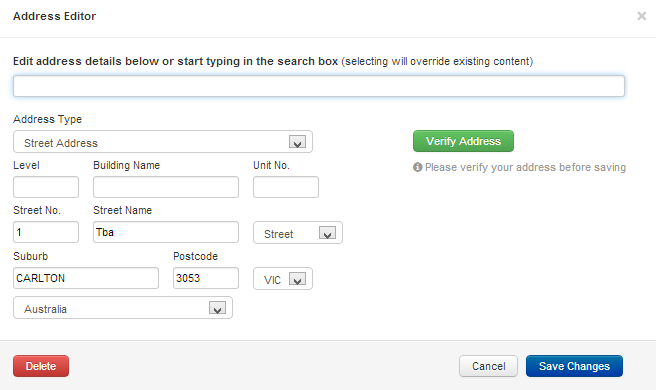 Some lenders will have full validation on address fields. In these cases you will need to enter a complete and verified Australian address in order to clear the validation message. For a pre-approval, it's best to enter: 1, TBA Street, [valid suburb/post code]. The valid Suburb and Post Code will clear the validation error. Other address issues can often be resolved by deleting the address (red delete button above) and re-creating a new address.